OLIVER COOPER, Leader of the Tory Youth wing, has officially yielded to a coup d'etat by Tory activists, as predicted by theblueguerilla. Cooper sensationally backed #TeamPaterson and threw his weight behind Alexandra Paterson to replace him as Conservative Future (CF) Chairman, TBG can reveal. 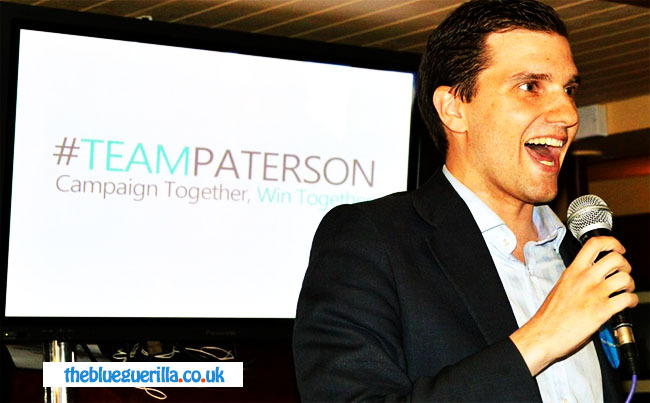 The ground-breaking announcement came at Team Paterson's launch party onboard The Tattershall Castle, a posh boat in Central London, last week. There was a noticeable "absentee" from the party which led one CF'er to question if - "They were above deck pulling the strings." Alexandra Paterson, #TeamPaterson candidate for National Chairman, told TBG - "It was an absolute honour to welcome so many people onboard The Tattershall Castle for the launch of our Conservative Future election campaign, and it was a true privilege be joined by Oliver Cooper." Cooper & Co now see Paterson as the unifying candidate and will be hoping their supporters lend Paterson votes in the upcoming CF National ballot, in which ferocious campaigning has already begun. #TeamPaterson candidate for Deputy Chairman Political, Stephen Canning, said - "The launch night was great fun, and it was fantastic to get to meet so many people who I hope agree with our vision of a hard campaigning, hard winning Conservative Future." India Brummitt, #TeamPaterson candidate for Deputy Chairman Membership exclusively told TBG - "Speaking to people at the launch party showed me why what we're doing is so important. We need to step through the wardbrobe and make Conservative Future the amazing campaigning force we know it can be." Annabel Shaw, #TeamPaterson candidate for Best Practice Officer said - "It's only the start of the campaign, but I've enjoyed every minute of it so far and in the exact same way I will enjoy the challenge of making sure Conservative Future is fit for purpose ready for 2015." Event held on private boat in London. Really a great statement that CF wants to attract normal people, doesn't it? I'm a branch Chairman in the country who is pretty fed up with a London and Oxbridge-led CF executive that, sorry to use Labour's soundbite, is desperately out of touch with it's core membership. I'm tired of going to events surrounded by children trying (and failing) to act upper class. The fake accent and the hubris does not win over many votes on the doorstep, and the national organisation is shoddy and poorly co-ordinated. The corporate culture is toxic. If CF spent as much time campaigning and marketing as it did bitching and plotting about each other we might even have a credible grassroots organisation. We are supposed to be the party of Thatcher and Major; of a capitalist, free market party that supports meritocracy and individualism, not who you've got on bloody speed dial. To candidates current and future; if you re-connect with true conservatives who've fought their way up and know why we believe in what we do, you've got my vote, and then some. Posting Anon because I'm not so outspoken as to realise this would come back to bite me in the arse. So they've already proved they can put on a better event than the current exec? My vote is sold. Oli endorsed Paterson because he's known her for 7 years and is aware of her soundness. Oli endorsed Paterson because he doesn't dare publicly opose tjose funding and supporting the slate. Jsj has done her job. She sold him out to Clarke then got him to sign his own death warrent. Don't get much colder than that. I was horrified to hear the part she had in this. Haven't her and cooper been a covert item since the last election? Disgusting. Or coopers just not stupid and knows that this is what cf needs? I think Cooper was bought off with a few greasy KFC family buckets. At least that makes oli back on the singles market. I wonder if he'll take me to kfc? Make it nandos and I'm his for the evening.